Searching for cute and funny quotes to say or write down to your dear aunt. If yes, now you don't need to search for them anymore. 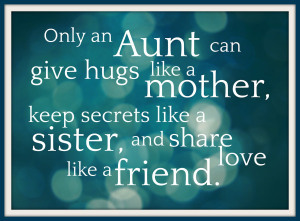 As here I have compiled down some of the cutest aunt quotes and sayings. Just hope you will like this quote compilation and able to find some cute & funny words to say to your lovely aunt. God couldn't be everywhere so he created Aunts. I not only call you aunt, I call you friend! An aunt grows more treasured as time goes by. Aunt - a double blessing. You love like a parent and act like a friend! There are angels walking on this earth disguised as aunts! Aunt: A cherished friend and personal cheerleader who will always see you through rose-colored glasses. People who are nice as you are great to be related to! Aunt, without you there were many occasions I would have missed, things I could not have achieved and I don't think I would have grown into the person I am without your influence. Aunts like you are precious and few. When a child is born so is an aunt.